This Thanksgiving, Pringles is testing a new and exclusive, limited-edition tray of Thanksgiving-themed potato crisps flavors that they're calling the "Pringles Thanksgiving Dinner" but, chances are, you won't get to try it, at least not this year. According to the brand, "The exclusive rollout of Pringles Thanksgiving Dinner is available exclusively to members of the media and selected influencers." It is not available at retail at all. It looks like they're just looking to see how people take to the idea of the concept (since they won't actually be able to try it) and see if they can generate buzz for a future launch. 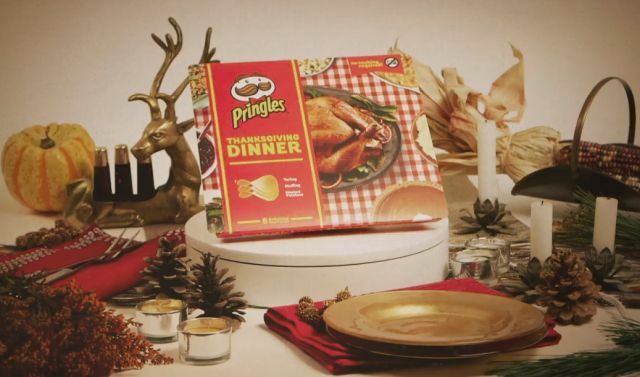 In case you're wondering what you'll not be getting, the Pringles Thanksgiving Dinner includes a total of eight flavors, each inspired by food you might find on your Thanksgiving dinner table. They are: Turkey, Mashed Potatoes, Stuffing, Cranberry Sauce, Creamed Corn, Green Bean Casserole, Mac & Cheese, and Pumpkin Pie.